The Imperial Guard are the most diverse human military forces in the galaxy, covering trillions of fighters from cultures and worlds more diverse than anything seen today. 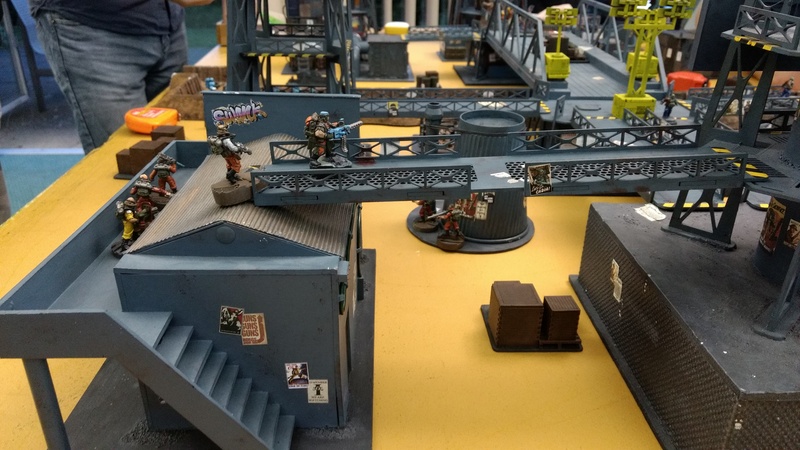 As a general trait they lack many of the table entry and mobility options of other factions, have few special rules or exceptions and instead they bring the gear. 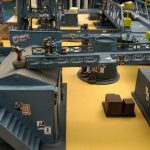 With a broad range of weapon options and different chassis to deliver them as well as bulky formations and lots of customisable upgrades the Imperial Guard play as almost the ‘core’ experience of Epic: Armageddon. 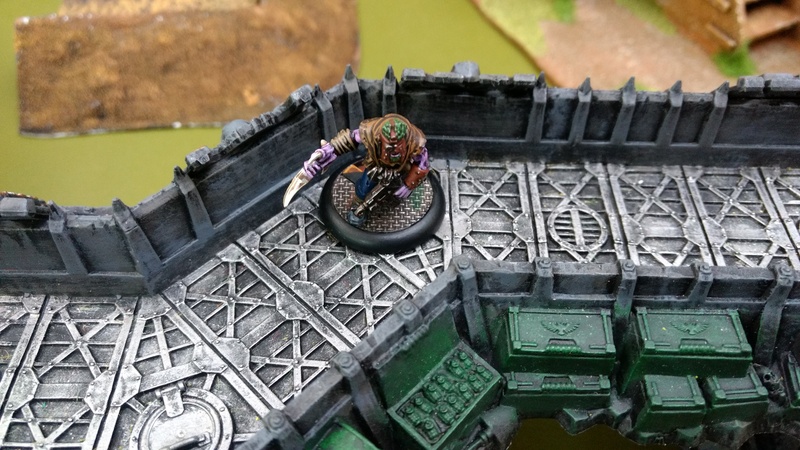 Using the core game rules with few exceptions and few of the exotic tools they are fantastic as a beginner faction and are very easy to find proxy models for, have huge options for conversions and unique colour schemes. There are five different lists available for them in EpicUK, with each one focussing on a different style of warfare giving you options to pick the one that favours your style. 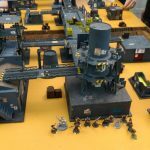 Further with much of the equipment being shared you can often reuse your models to play as numerous different lists. If in doubt the Steel Legion list functions as a great ‘all-rounder’ that can be readily built to approximate the style of other Imperial Guard lists. 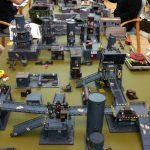 The grandaddy of all Imperial Guard lists in Epic: Armageddon. It has been barely changed since the original printing (mostly changes to how commissars are provided and the price of Griffons going down). This list has great potential with the core formations allowing for infantry hordes, armoured lists, artillery companies and so on to let you build the lists you want. The list also epitomises a core Imperial Guard design conceit in Epic: Armageddon. Rigid flexibility. The list requires taking the large, often expensive core formations to allow you to take the small, cheaper specialists. Then you can add on lots of upgrades but only to the already large expensive core formations. This tends to mean you will end up with a few big, powerful companies and a cloud of smaller supporting elements and the trick to using this well is to know when and how to deploy your hammer blows and when the specialists should step to the fore to do their jobs in concert with the rest of the army. One key detail to remember. Imperial Guard Infantry in the open is rubbish. Imperial Guard Infantry in cover is a nightmare to shift. The Steel Legion list, despite the allrounder potential, specialises in Mechanised Infantry and has access to some very good formations. The basic Mech. Inf. 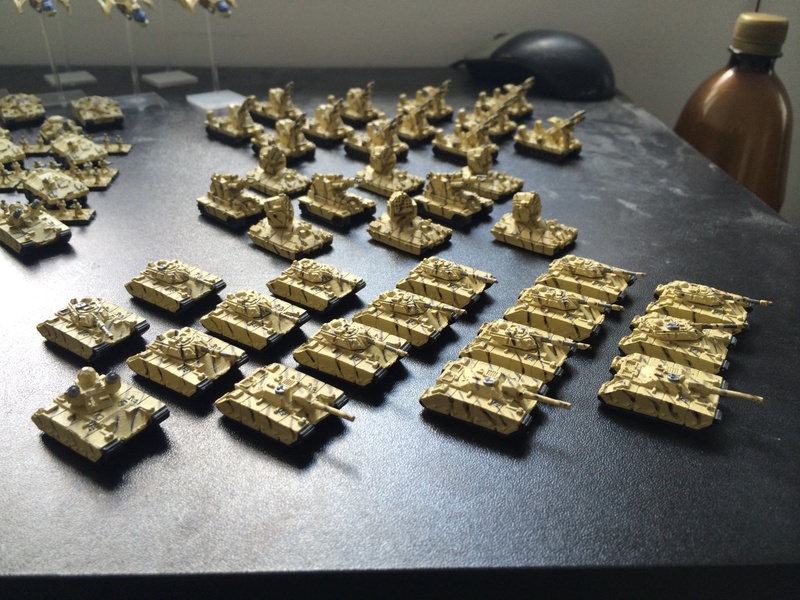 Co. plus a single Hydra upgrade is 450pts and gives you 8 tanks, 1 commander and 12 infantry for 21 models. Add in a Commissar. This now gives you a powerful, fast formation that brings its own anti-air cover with it. Get these guys forward, get the infantry into the hardest cover you can find and sit on objectives. Use them as the engaging hammer blow to drive enemies off the objectives. While it also has a lot of firepower in the volume of dice it can throw the to-hit rolls aren’t great, especially against armour. If you really must smash the enemy then an Engagement with proper support (and placing blast markers on the enemy first!) is often a better option than sitting back and hoping for 6s. 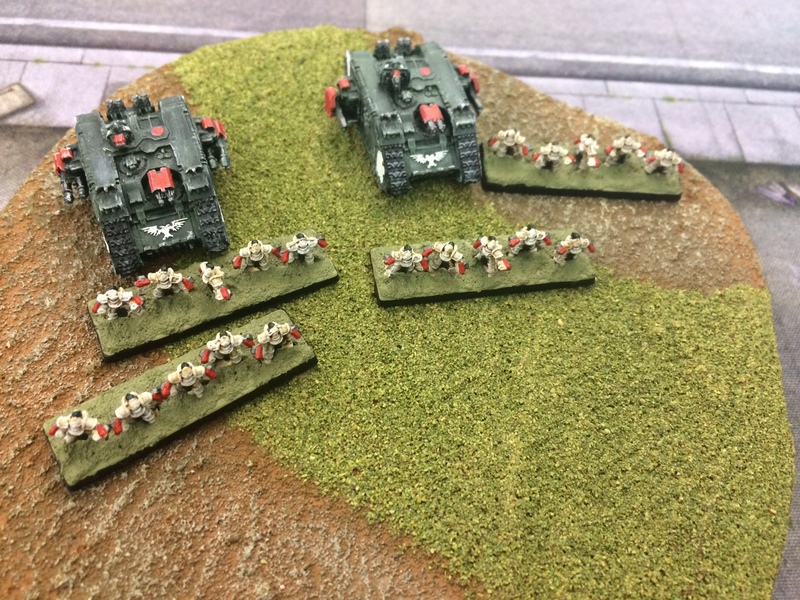 Another little trick when attacking with these Mechanised Infantry Companies is to make your Engagement move to get as many models into 15cm of the enemy as possible but always place the Chimera as the front rank closest to the enemy and not the infantry. the Infantry has no save while the Chimera have a 5+. That can make a big difference to the combat resolution when you’ve taken 1/3 fewer casualties than if you had the infantry at the front! You will be taking the Regimental HQ. It’s just so essential to have the Supreme Commander ability for the Initiative 2+ guardsmen, that reroll can win you games or lose them at the critical moment. It helps that the Regimental HQ is also a fantastic mechanised infantry company! 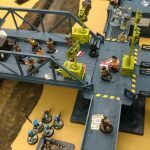 The steel legion list has issues getting the number of activations it wants onto the table. The high cost and necessity of the core companies means fewer points for support formations (and some of those aren’t that cheap either!) and even fewer points for upgrades. Generally you’ll want to aim for 10-11 different activations at the start of the game so some of those cheaper formations are very helpful for this (as well as being good in their own right). 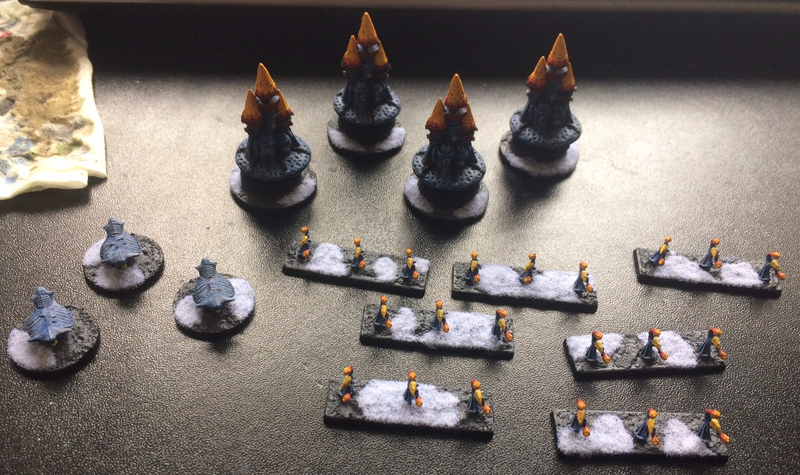 It is a rare Steel Legion list that doesn’t take at least 2 sentinel formations deploy them forward early, hidden as best you can but covering as much width as possible. This should give you space to rush up to the half way point with your attacking elements while the opponent spends time and activations clearing away the sentinels. Where possible take Warhounds as solo machines, not as a pair, solo they work much better as a mobile strike piece and are really good at supporting your Engagements by running to the enemy, shooting them and sitting within 15cm, then you engage with the Mech. Co.
Basically every formation on the list is great. 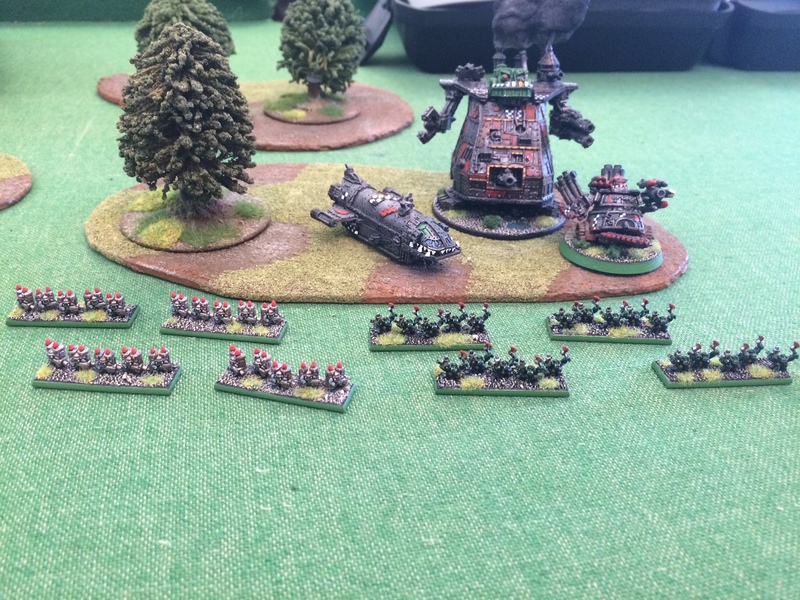 Taking the Regimental HQ, another Mech Co. or two (substitute in the Leman Russ for a Mech. Co. if you prefer) a few sentinels and that will be a strong, reliable core then whatever else you choose will be a good, strong investment. There are, however a few duds in the list. The Artillery Company (not the small battery, the big company) and Baneblades. the Artillery company is very, very powerful but is also very vulnerable to any passing shot and can only hit one area at a time. For the cost it’s vulnerable and needs even more points to babysit it and while it has huge damaging potential it is fickle with a failed activation ruining its day and being one big hit. Multiple smaller batteries can be more successful. The Baneblades suffer from a lack of focus. They have guns for all ranges but really need to get within 30cm to make that worthwhile but they also only have a speed of 15cm so they need to do a lot of marching (which means no shooting!) or doubling (which cripples the firepower output with to-hit rolls) to ever really get a chance to use those guns. They’re no tougher than the Shadowsword (hint: put a commissar into a Shadowsword or Baneblade!) and the Shadowsword brings a unique and extremely potent weapon along as well as great range. The issue isn’t that the Baneblade is particularly bad, the issue is that it competes against the Shadowsword. These guys are a difficult list, very different to basically anyone else out there in EpicUK land, they have some very major flaws and some very major shock and awe moments available to them. Maybe don’t expect to come away to consistent wins but to instead come away with a few glorious and uplifting victories and rather a few more of those losses that we’ll politely ignore. The list really only has a few options and even fewer to deal with enemy armour (so take the Vendettas where you can!). Your core will be the regimental HQ again and then a few Air Cavalry Companies. 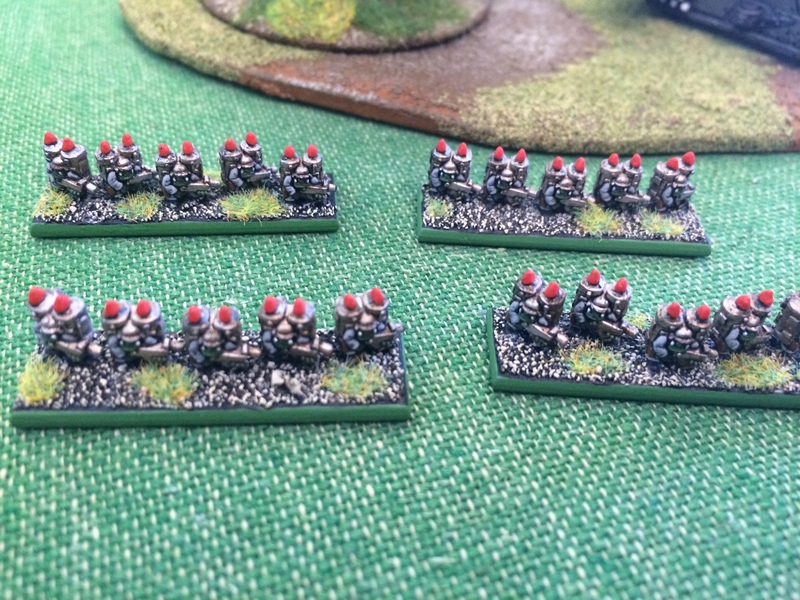 These carry a hefty amount of firepower with their rocket pods, heavy bolters and multilasers, are extremely mobile but also quite vulnerable (hint: attach your free Commissars to the Valkyries not the infantry stands). You want to be able to find an optimal moment to fire your rockets which means not taking casualties before doing so and avoiding picking up blast markers too (as if the blast markers suppress your valkyries that’s a dramatic cut in firepower). Learning how to hide your Valkyries early on to be in position for a single big rocket attack to break and drive your opponent before you is a key skill. Generally the core tactic is to use your sentinels and other light forces to buy you time and block the enemy advance. Your turn 1 should be fairly low activity, you’re trying to get your formations into a single advance+missile range of the enemy without taking any damage or coming under fire. Then early on in turn 2 you advance and fire every rocket you can to break as many enemy as you can. Then you need to keep the pressure up and prevent them from rallying and getting back into an organised counterattack. You get one shot at this and it can be vulnerable to being disrupted early and if you’re forced to double to fire those rockets you will likely find your attack power dropping dramatically. But when it works it’s glorious. Shock and Awe in Epic form and extremely satisfying. Defensively you also have a lot of tools with the huge abundance of scout on your forces you can cover and contest ground very easily, added to the mobility yo can bring to bear you can focus on turning a loss into a draw by just making it near impossible for your opponent to actually get to and control the objectives on the board. Early on you want to keep your troops safe and you have a critical unit for doing this. Vultures. Any list with access to them can do this but for the Vanaheim it’s very very important. The Vultures have 2×2+AT rockets with 1 shot and 120cm of range on a skimmer chassis. Start them on the table as one of your Garrisons, hidden right at the back and popped up. Put them on overwatch. Any enemy unit with vehicles that dares come into the open (even if only briefly) can eat itself those rockets. Blowing apart tanks or transports, crippling small titans, whatever. Once the rockets are fired the Vultures remain a very fast, decently armed scout unit. A pair of formations will do nicely thank you very much! The list lacks ground based AA and ground based AA is usually better than aircraft AA due to the passive area control effect. Instead you have access to an abundance of aircraft including the Lightning which makes a great anti-armour formation for very cheap as well as having long ranged AA weapons allowing it to snipe out other enemy aircraft outside of their own defensive AA range (it does lose volume of fire for that range though). A mix of Lightnings and Thunderbolts is advised. Overall they’re kind of like what happens if the Imperial Guard tried to be Eldar for a day. Fast, powerful impact but little ability to sustain the attack. take them because they appeal to you, not because you’re looking to claim victory after victory. Blitzkrieg! Struggles a bit at lower points totals, even 3k can be a stretch but as you climb to 4k they really come into their own. Designed as a very aggressive armoured assault force the idea is to get your guns into range and just drown your foe in so many heavily armoured bodies and so much concentrated firepower they wither under the hail. The core advantage you have here is the smaller and thus cheaper Leman Russ companies that can be equipped in varied ways. They also have access to cheap, tough, tanks and tougher scouts than is common. You still want the Regimental HQ despite the cost for the reroll on activation then probably a pair of Leman Russ Cos. Pick their armament carefully for whatever role you want them to do and don’t forget the 4+ firefight value they have making them a very effective engagement force. Despite not being as fast as the skimmers of some factions the army as a whole can be fairly mobile, especially with the long range on the guns giving you a great deal of threat range. In your support slots you can bring the Salamander Scouts for control and keeping people away from your Leman Russ and artillery support who should really focus on removing the smaller and mobile elements of the enemy army. On attack your Leman Russ are great, they do lack the ability to be everywhere at once though and sending something as potent and expensive as a Leman Russ Co. after a small scout formation is a waste, artillery can strike those for you without needing to expose themselves. You also have access to the Leman Russ Conquers, fairly cheap, bulky well armed and armoured make great forces for holding objectives after your core Leman Russ have rolled over them. Particularly interesting though are the small 100pt Griffon batteries, good for bulking up the activation count but getting them halfway up the board, hidden out of sight on turn 1 means they can then spend turns 2 and 3 dropping shells on the entire table or have them double or march for 90cm of objective grabbing and contesting. All in all a fun list that grows more competitive as points become more readily available. The Baran are an almost purely defensive force, relying on waves of infantry, bunkers, trenches and emplacements to form an impenetrable line behind which huge amounts of indirect firing artillery blast your opponent from the table. When, and only when, all enemy resistance has been blasted to the dust do the infantry climb out of their bunkers and make their way to claim enemy objectives. It’s an appealing thought and I know many a person who dreams of running a perfect defence in this way. It however runs into the problem of often being a fairly static and dull game. 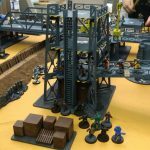 You won’t be doing a lot much of the time and your opponent may well find themselves with few options aside from getting hit by artillery again and again or throwing bodies into your reinforced bunkers (guardsmen with 3+ saves!?!). If the list operates as designed it can be a fairly negative play experience. This is not guaranteed though. The highly air mobile enemy (like Marines or Eldar) or skimmer happy (Eldar, Tau) etc. 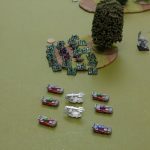 can play all sorts of havoc with your carefully arranged battlelines and you’ll be facing a tense game where you have to balance chasing down those mobile forces in your backfield but having your infantry abandon their bunkers to do so. First up the standout feature of the list is that you can buy fortifications. 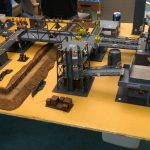 Giving you loads of razorwire and trenches (50cm) and bunkers for 100pts. basically these are your ‘transport’ options. 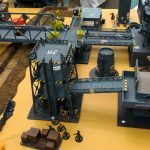 Steel Legion buy Chimera, vanaheim ride in valkyries, you turn up in a dozen tonnes of reinforced concrete. Typically you’d take 4 of these fortifications (which means taking 4 core companies too) as that gives you enough width to form a line across the entire table, then you garrison your infantry (as they all move 15cm) inside the trenches and bunkers half way up the table to form your impenetrable wall. You might add the 6 additional infantry to these companies to make them bulky enough to survive and occupy the ground. The rest of the list is really toys for you to take to spice things up. You’ll want to bring large amounts of artillery to give you the reach and threat that you otherwise lack. Scatterings of the AA guns all over your deployment to provide air cover are advisable. Siegfried as your scouts to cover ground inside your half to make it so they can stall out any breakthroughs long enough to get your guns on target. A few things to bear in mind with the Baran. Enemies can take your entrenchments and claim their benefits too! 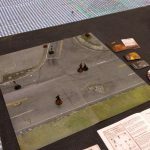 The Hellhounds, Sappers and Bombards Ignore Cover rule can be very helpful for digging the enemy right back out again. Also be careful with stringing your formations out in a thin line in their trenches, this can make them very vulnerable to being hit by a clipping engagement, think carefully about where your formations will sit and how they will cover one another with supporting fire without stringing out and becoming vulnerable. 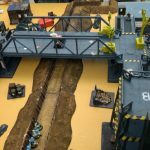 Placing the bunkers just behind the trenchworks means you can concentrate your formation into a block rather than a thin line whilst still enjoying the benefits of all that concrete and razorwire. There’s probably some ingenious super aggressive Baran build out there to take the world by storm but it really is designed with the intention of absorbing and repulsing any attacks and blowing the opponent away with artillery (hint: destroying their BTS scores you 1VP, controlling two objectives in your opponent’s half scores 1VP, if you place two objectives just past the halfway line you can garrison in control of them at the start and just need to make sure they remain clear end of turn 3). Then casually walking onto objectives at the end of turn 3. The list is borderline to overpowered. This is the guard in ‘siege breaking mode’ and it’s damned good at the job. The heart of the list is the Infantry mounted in Gorgons (avoid adding the extra in the upgrade, while 30 and 3 Gorgons is great it’s also very expensive). These guys roll forward as an unstoppable tide around which the rest of the army moves. Keep them alive, keep them safe and prevent them getting bogged down by enemy scouts or other blocking units. Focus on getting them into the objectives or right into the heart of the enemy. 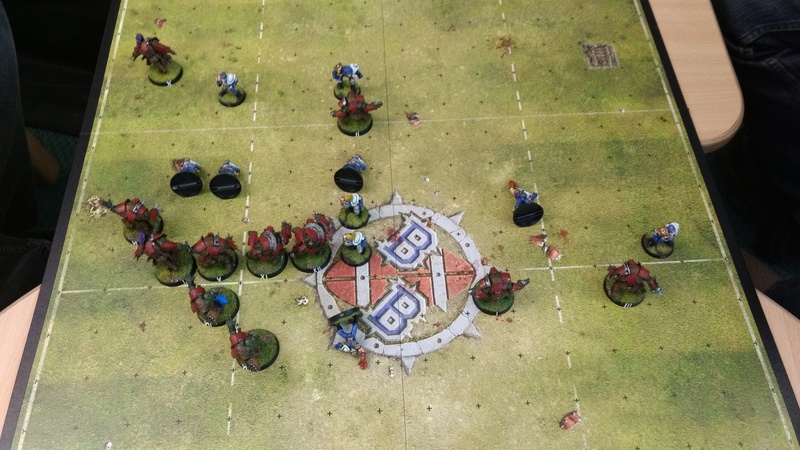 The trick in Engagements is to make sure that your Gorgons get into base contact with at least one enemy before disembarking the infantry (arguably the infantry should not be dismounted until the last possible minute!). Because the Gorgon is in base to base it will always be the closest model to the enemy and when you assign hits in an Engagement and it’s damned tough so can weather the hits your infantry can’t. The pair of Gorgons in base to base means the first 6 hits on the formation are going to their rock hard armour which can make a big difference to winning those fights. The support formations are filled with war engines and artillery adding to a very ‘heavy metal’ kind of feel and the list runs well when focussing on these elements. The list can also be run as a defensive entrenched force though if this is your plan the Baran are probably better ay it. There is also a cavalry focus build available using the big death rider company and the smaller scouts, it’s a more unique build and arguably not hugely competitive but well piloted it can pull off some stunning engagements – it does suffer when it can’t get into base to base though (such as enemy skimmers of the opponent engaging you in a firefight). An aggressive army that revolves around the Gorgon mounted infantry companies, focus the rest of the army on making a path for the Gorgons to get where they need to go and preparing the targets to get run over by a hundred tons of steel and Imperial vengeance! Hope you found something useful here. Not a lot of variety tonight as 14 players geared up for next weeks Shadow War: Armageddon campaign. There was a game of Blood Bowl though. 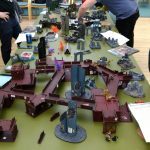 Guildford Games Club is once again hosting World of Twilight for their annual Twilight Day! This year the event will take place on the 25th June at the Park Barn Centre. Mike has offered all Guildford Games Club members a special 20% discount on the ticket and on any orders until the event. 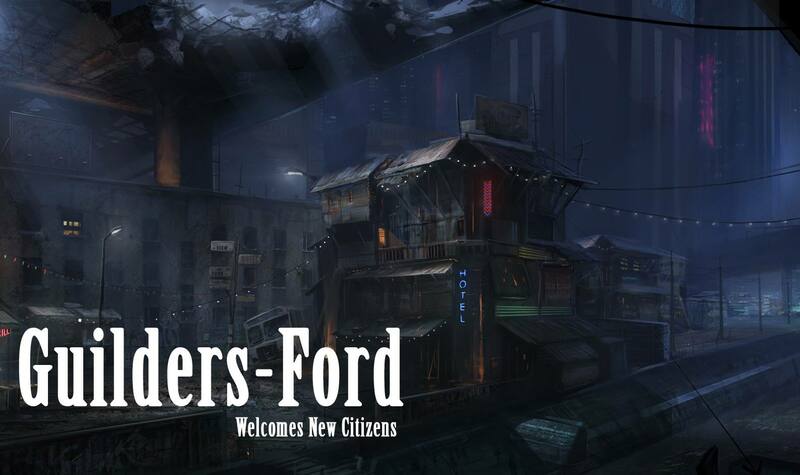 See the Guildford Games Club Facebook Group for details. 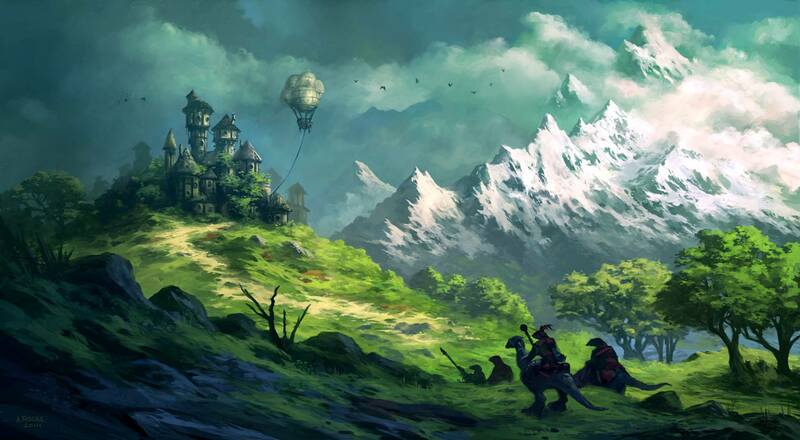 The World of Twilight is a skirmish game set in the unique fantasy world of Anyaral. It has got some innovative features to the gameplay and generally quite small forces so gives a fun day of games. There are quite a few Twilight players in the club, so it’s easy to find somebody to give you an intro game, or you can just come along on the day and try it out. In previous years this has been a well attended event with plenty of players turning up from across the UK (and even the US last year!) 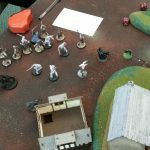 for a day of themed games and scenarios. 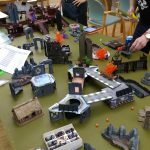 Mike (the creator of Twilight) will be there, organising everything, with a mix of introductory games and a campaign for the experienced players – this year the campaign will focus on the Kedashi swarms of the Naralon forests, but you can try any force you like. If you don’t have any models, or want to try something new then there are plenty of painted forces available for you to try out! Mike has also promised a chance to see some previews of his latest sculpts. There will be a few freebies for everybody, plus prizes on the day. 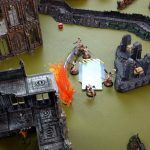 This week we get to plumb the depth of knowledge of Guildford Games Club member Matthew Arnold who has kindly written up his thoughts about the different Ork army lists in Epic: Armageddon. I’ll hand you over to Matt. Ghazgkhull’s Horde is an all arms, flexible list, in fact it is noteworthy for being the most varied and flexible list in the game! Here’s why it can be so much fun! Orks believe that as long as there are a bunch of them still fighting together (slightly more than they can count up to is ideal!) then there’s always a chance that they’ll prevail, no matter the odds. 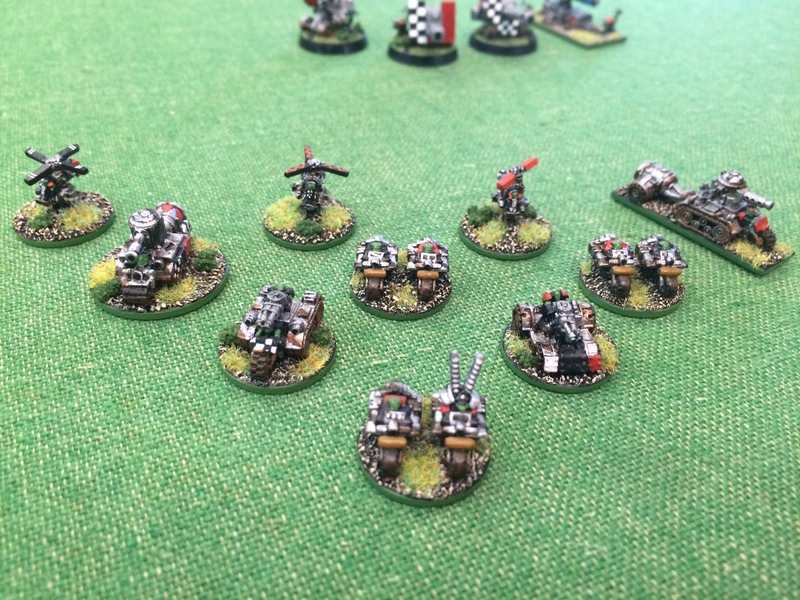 To represent this, Ork formations with more than five units, not including Grotz or Big Gunz units, receive a +1 modifier to any rally rolls they make, and formations with more than ten such units receive a +2 modifier. For the purposes of this rule, war engines count each point of starting damage capacity as a unit. These special rules also apply to all Ork lists including Speed Freaks and Feral Orks. Orks are born for war, it’s instinctive, so as long as you play aggressively as is natural for Orks they will carry out orders with a reliability on a par with Marines, just don’t expect the outcome to be quite as reliable! 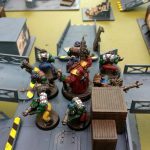 The results of Ork shooting, engages, and armour saves are volatile in the extreme! But even the unpredictable nature of how Orks react to coming under fire or being in a fight can be used by a wily Ork player … moving an ‘Uge Mob of Boyz up to an enemy formation and shooting them a little will cause little to no damage, but it will put a blast marker on them and leave them with the tough decision as to what to actually do about that mass of Orks taunting them, the Mob Up rule makes them surprisingly difficult to shift and it can be tough predicting the outcome of a toe to toe fight with Orks! 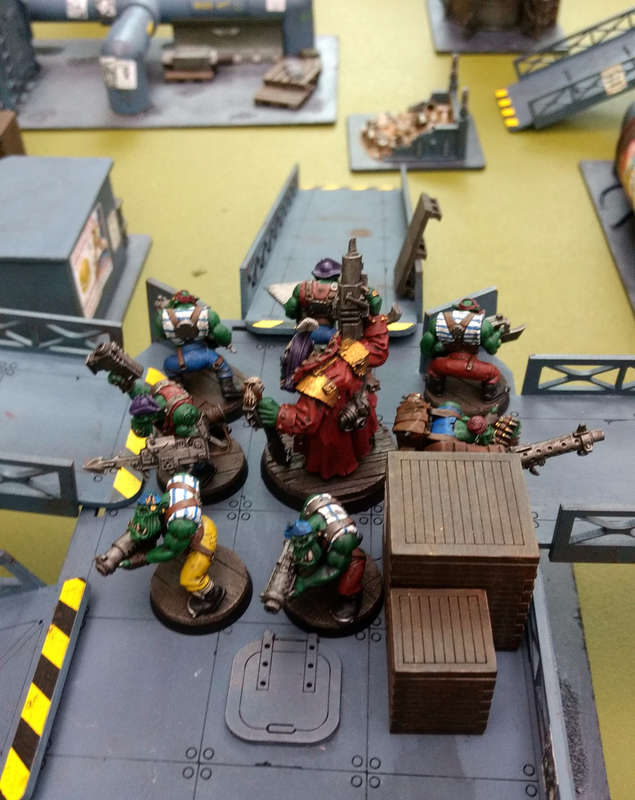 Ork players also have access to a massive variety of units and key word abilities such as sneaky Scouts and Infiltrators, Disposable Grots, Supa Gunz with Titan Killer or Barrage, Stompas with Reinforced Armour and so on. This pick and mix of units are available in battlefield formations which are highly adaptable, Ghazgkhull’s Horde is one of the few list where players are encouraged to upgrade and beef up the base formations through discounts when doubling or tripling the size of the formation as listed so no two Ork formations or armies will be alike. 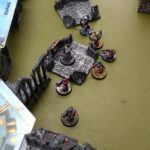 Ork players are able to take advantage of synergies like few other lists can. Your Boyz getting shot up? Add some “Disposable” Grots as a bullet screen or heavy armour and mobile cover in the form of Dreads and Stompas, or both! Need some more firepower? Add Big Gunz or Odd Boyz! Trouble with aircraft? Speed around the table with an entire formation of Flak Waggonz or take a squadron of 20 Fighta Bomberz! Almost any grand strategy or crazy tactic is possible with the list, you can build a force of purely infantry or armoured vehicles and watch your opponent weep as all their las-cannons or heavy bolters are rendered useless, you can take hordes of light vehicles giving you un-paralleled speed and manoeuvrability, a whole army which Garrisons on the objectives from turn one and still retains and enormous amount of variety, go for an air assault list with five Landas…. 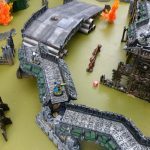 Ork players always have the opportunity to do something really surprising, and/or a bit mad! Both in game terms and hobby terms Ork armies are cheap to build, they have a huge variety of useful and cheap upgrades with handy key word abilities which can be easily knocked up out of parts from your bits box! Keep in mind those unreliable aspects of using the Horde list can be remedied by taking lots of models to ensure the job gets done! Hint: Getting more than one of anything for 25pts in EA is a bargain and you can’t go wrong taking advantage of it, be that shots or units…. beware getting carried away though as you’ll risk getting timed out in tournament play as you’ll have lots to do each turn! The units don’t look stellar on paper but they’re cheap, can be mixed into formations how you like for brutal combinations of attributes and abilities, and most of them have the excellent mob up rule making them extremely reliable. 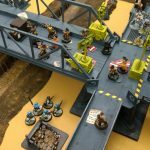 The challenge of using Gaz’s Horde is capitalising on those reliable command and control aspects of the army without falling foul of how fickle it can be close up. Authors view: When it comes to winning games and tournaments the key for the Ghazgkhull’s Horde list is surprise and invention, if you want to build one optimised list and get to know it inside out for best results, a Horde may not be for you. These variant lists both sacrifice a little variety in favour of slightly more reliable performance when getting to grips with the enemy making them far more straight forward. The Horde is a mid-tier list which will always have something to bring to the table, both Speed Freaks and Ferals are top-tier lists but are far more predictable and can come unstuck verses some armies and opponents. Neither Freaks nor Ferals are seen as frequently as Gaz’s Horde lists at events as they’re both most effective as Horde lists requiring a lot of repetitive painting (up to 120ish mostly red or brown tiny models!) and the models are slightly more difficult to cobble together from your bits box! The Speed Freak list sacrifices access to slower and/or heavier units in favour of more fast light vehicle units at a discounted price. Whatever Speed Freaks do is fast and on mass, their usual tactic is to overwhelm one section of their opponents’ battle line and then sweep through before any coordinated response or plan can be put into action. Its great fun moving formations of dozens of Buggies and Bikes a meter at a time whilst making engine noises but it can take some time! 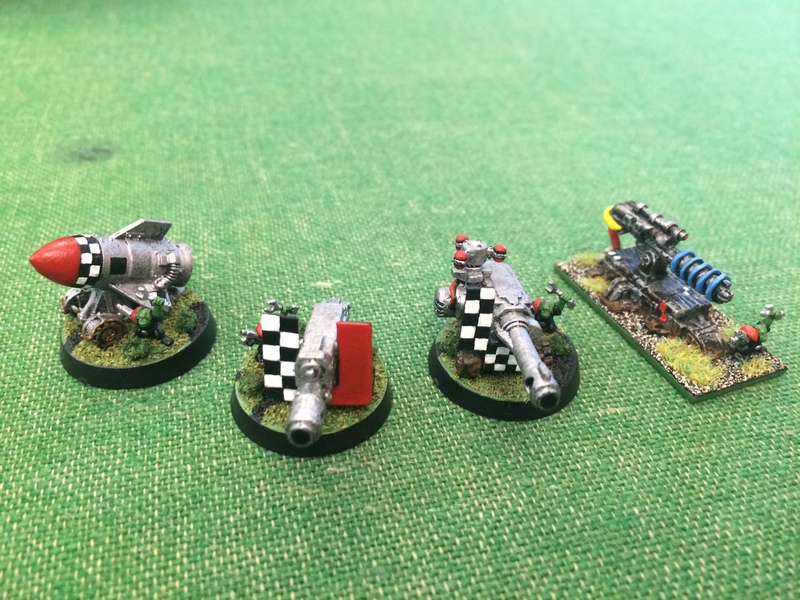 Speed Freak players need to play as quickly as their army moves in order to finish games at tournament (and to avoid annoying their opponent). On some occasions Speed Freaks will come across an opponent who know exactly what they’re doing or have a formation that a massed assault of light vehicles just can’t crack (Hello Warlord Titans!) and the main thrust of the army will bounce, at that point it’s anyone’s game! 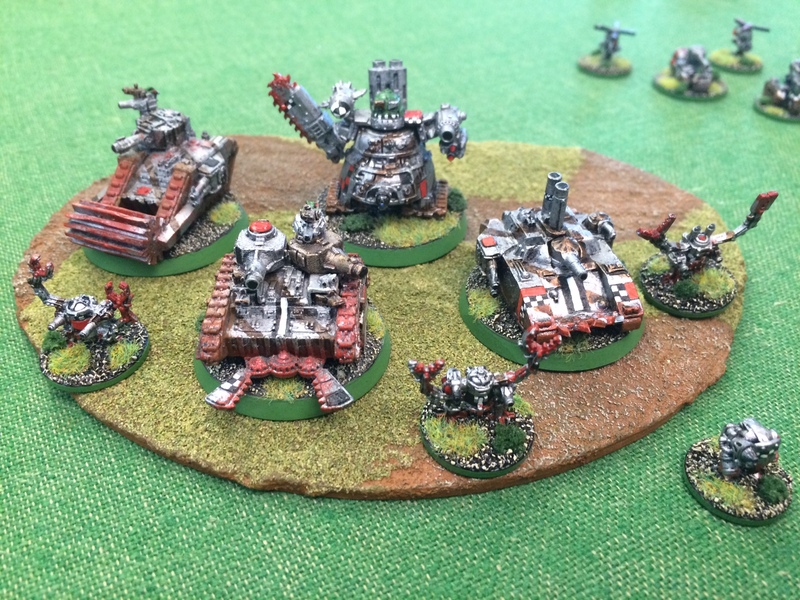 Hint: Boyz mounted in Truks are exceptionally good value…..
Feral Orks sacrifice access to anything which looks much more sophisticated than a kettle in favour of numbers and a few oddities. The main tactic will always be a general advance which is just tough to stop as there’s either a tide of typically enthusiastic Orks, or the army is riding on a menagerie of armoured dinosaurs! Often both! Opponents are limited by their ability to manoeuvre around so many bodies, even aircraft have a tough time as Feral or Weird Boyz have the ability to swat aircraft out of the sky with a devastatingly powerful psychic attack (say goodbye to your fully loaded Thunderhawks and Vampires!). Again, with certain builds Feral Ork player run the risk of having too much to do if they’re not focussed and they will sometime meet opposition they just can’t overwhelm by force of numbers. Hint: Junka Truks are great value and hordes and hordes and hordes of Boar Boyz can make for a really tough list! 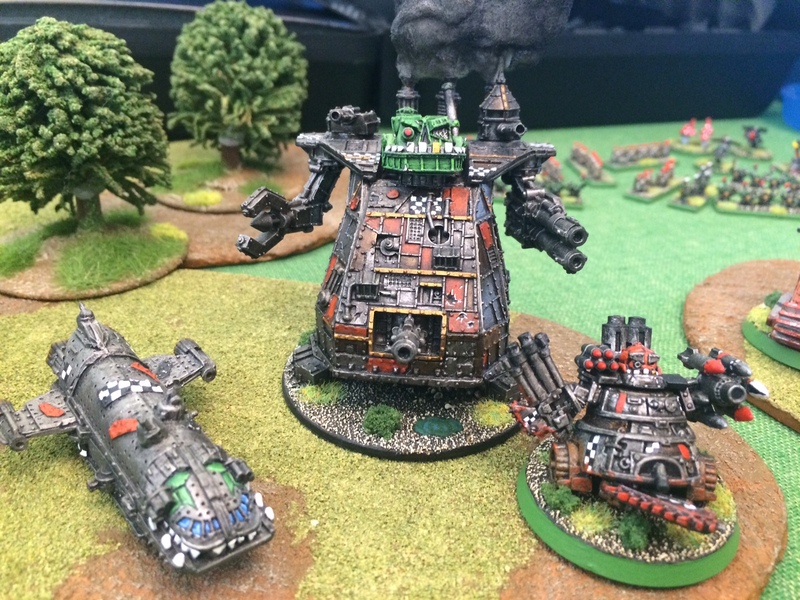 Author’s view: In contrast to Gaz’s Horde a Freak or a Feral player will do really well building a list they love and works for them and sticking with it, play well and to the Orks’ strengths and they will perform consistently well…. Also you don’t want to have to paint even more brown or red right?! Thank you Matt for your input! 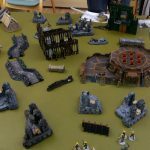 Hopefully this will inspire someone to give the Orks a try or dig them back up out of that dusty box and give them some table time! 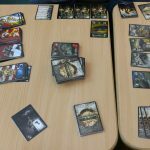 Kings of War 4 player game. 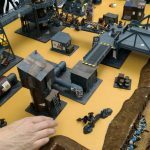 Shadow War: Armageddon campaign practice. 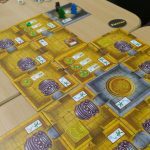 Escape from the Temple and Quarriors boardgames. When starting out (or expanding!) people often like to have some idea about the factions in the game. How they play, what strengths and weaknesses they may have, if they have a style or theme that will fit with their personal preferences. Additionally whether there are units or options that are popular or not can be important (after all, if you like a faction because of a unit or two on their list and then find those units are generally not useful it can make it a lot less fun to play as that faction). I want this article to explain each of the army lists in some brief detail to give you a starting point to selecting who you want to play and maybe giving you some ideas of the different kinds of strategies people use in Epic. I plan on putting up a sequence of articles looking at the different faction groupings in Epic: Armageddon and giving a brief overview of them. This will be from my own perspective and experiences and I have not played with nor against every permutation of every faction so there are guaranteed to be bits I miss of get wrong (though, I will try to reach out to broader community voices and expertise where I know I am sorely lacking in useful information). However, I should hopefully be able to provide an at least generally accessible point to begin looking at and assessing the different – EpicUK – factions for Epic. But first a note on how Epic: Armageddon designs army lists. The game tries to avoid ‘generalist’ lists where it can and instead tries to have lists that focus on a playstyle. For example there is no ‘Imperial Guard’ list, instead there is a Steel Legion, a Baran Siegemaster, Ulani Tank Regiment, etc. list. This is because the relative value of certain units changes within the context of building a list that is trying to rely on aerial attacks or swarming heavy armour or scout dominated play. Remember that just because a list is called the ‘Blood Angels’ doesn’t mean it can only be used for playing Blood Angels and successors. Instead it’s a list for more close combat and aggressive engagement based play and anyone who wants to play their space marines that way would be well served in giving it a look. Consider the case of a Space Marine chapter that has recently fallen to worship of Khorne…Blood Angels with a different lick of paint all of a sudden makes a lot of sense for your marines! The Imperial Space Marines. Bioengineered warrior monks and crusading knight analogues in the sci-fantasy future! The razors edge on the blade of Imperial might. Keepers of dark secrets, wild ravaging nomads, crusading brethren and much more. 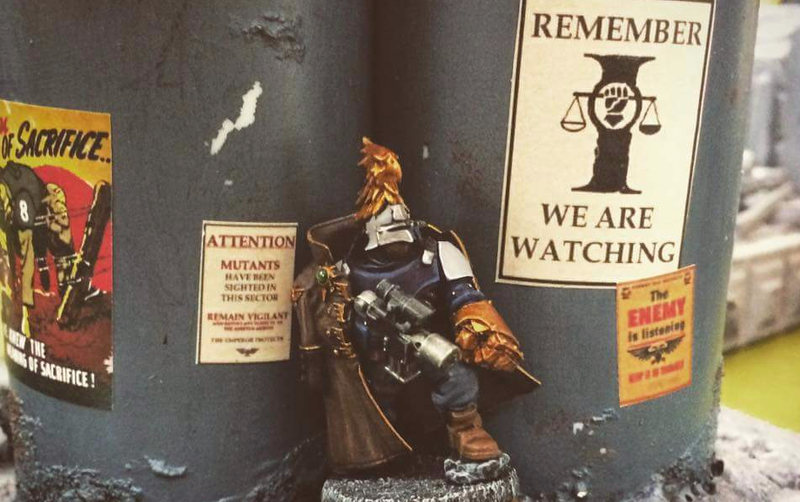 There are several chapters with their own lists as well as a basic Codex Marines list. Dark Angels, White Scars, Blood Angels, Space Wolves and Black Templars. The Codex Marines list may appear at first glance as a more ‘generic’ list but it focuses on an aerial assault playstyle so may not be the best pick for how you want to play. Space marine lists tend towards having larger numbers of smaller formations. They tend to roll fewer dice but have better to hit values and armour values in return as well as the And They Shall Know No Fear special rule to overcome some of the weaknesses their smaller formation sizes can lead to. They also have good access to a lot of mobility options and ways of entering and leaving the table. 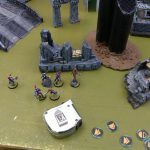 Space marines are a finesse force, requiring a firm grasp of how to get your models into positions to support one another, focusing their force in a small area of the table, destroying the opposition there and then often leaving the table again to rapidly shift the focus of attack to a different point. 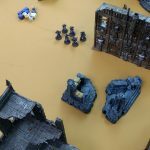 This makes them less beginner friendly than might be expected from Warhammer 40k but it does mean they play more like a group of special operative teams finding ways to overcome far larger numbers of opposition. The Codex Marine list generally favours use of aerial assets and scouting forces. 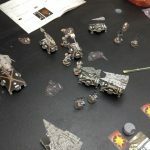 Using landspeeders, scouts and warhounds to create space on the table and to control how your opponent can move around the board whilst also placing blast markers on the enemy. Then, once an opportunity presents itself (or has been engineered by your scouting forces) you land a hammer blow with your aerial assets and destroy a part of your opponent’s army. Then ideally you extract the hammer blow formations back from the table and repeat the process next turn. This is mostly achieved through the use of a pair of Thunderhawks and a formation of Terminators. 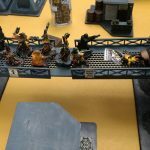 Terminators are extremely powerful and their weakness in mobility is overcome by using the Thunderhawks to land them on the table and then have the second (empty!) one land and pick them back up again to fly off the table. Cycling them on and off the table each turn. The list also supports more traditional ‘marines in rhinos’ rushing about the place though this exposes your smaller numbers of models to greater risk than the aerial approach. Or use of spaceships for orbital drops – which plays similarly to the aerial circus approach but lands more powerful assets in a single strike in exchange for losing the ability to recycle them for later turns. 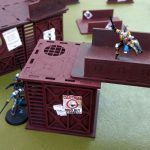 Codex marines also have many options and a very flexible army list allowing a great deal of freedom to make skew lists and play themes of your own devising. 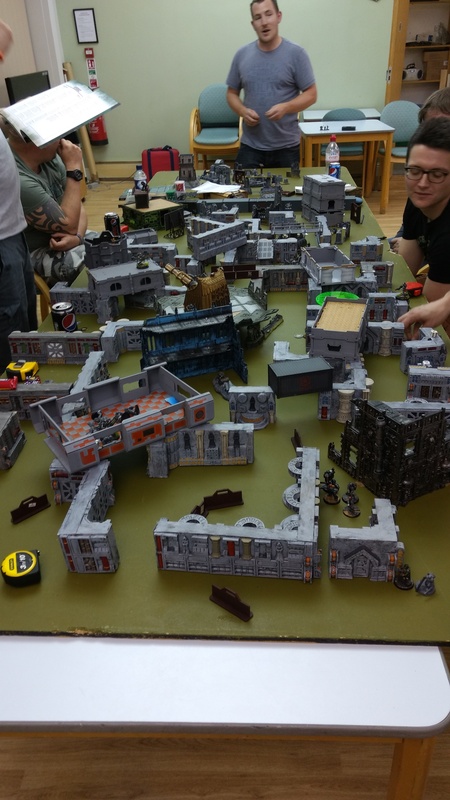 Taking nothing but Terminators or an armoured division with predators, vindicators and land raiders everywhere is…while not particularly advised from a competitive stand point probably a lot of fun to play. 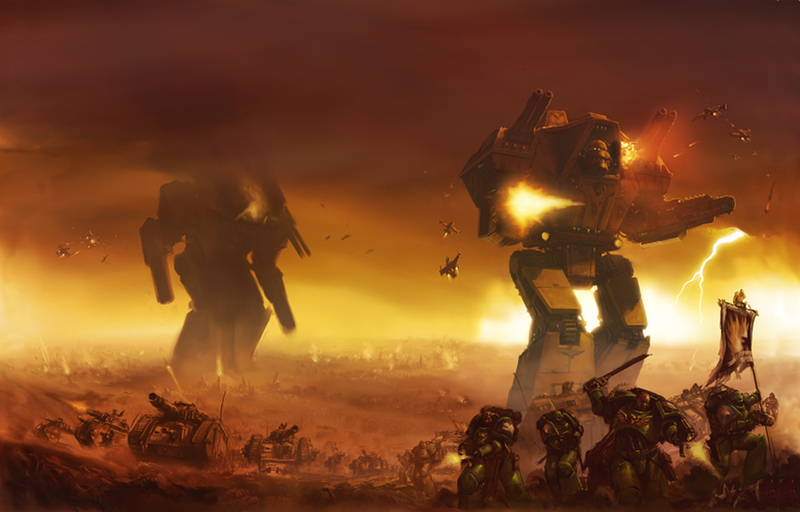 However the Codex marines have a general lack of good anti-Titan tools and dealing with large numbers of, or particularly powerful forms of, War Engines will take care and the correct use of the support fire rules to get enough models to be involved in the fights to overcome them. 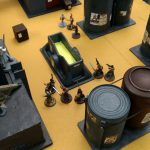 You will also likely find that your shooting phases are not a game winner, the combination of smaller numbers of models and shorter ranges overall means you won’t be defeating your opponents hordes of Boyz with raw firepower, instead the shooting should be looked at as a way of setting up your decisive Engagements. 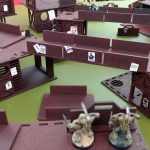 Playing successfully with the Codex Marines will likely require a good understanding of how to use the blast marker, Engagement and Supporting Fire rules so brushing up on those will probably help your play considerably! Very similar to the Codex Marine list in playstyle. 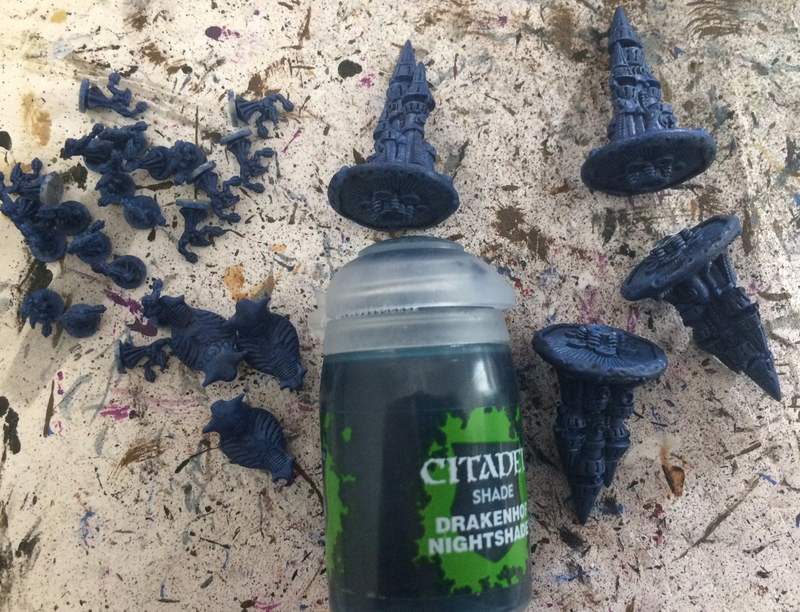 It sacrifices access to the Titan Legion and Imperial Navy assets (because Dark Angels need to keep their secrets, can’t have some nosy guardsman stumbling across something…) to gain better Devastators, Nephilim and Ravenwing formations. The advice for Codex Marines holds true here, scouting forces and aerial assets will be your bread and butter but the Devastators can make your orbital attacks more powerful (their better shooting is well worth the slow firing penalty because generally you’d want to shoot once and then be stuck in Engagements rather than standing off and firing multiple turns over) and the particular stand out is the Ravenwing formation. It mixes Bikes with Landspeeders and because of the Garrison rules allowing a formation that has at least half the models with the scout rule (the landspeeders have scout!) to Garrison that means you can have a strong combat formation on the half way line before the first turn even start! Dark Angels are arguably an even better version of the Codex Marines list. Due to their cost and list skewing impacts the larger Titans are not a common sight so their loss here is not really felt and the Ravenwing compete for the same role the Warhound would have taken. Nephilim are better – but more expensive – substitutes for Thunderbolts too. The White Scars diverge from the template laid down by the Codex and Dark Angels with larger bike formations (with Walker! ), loss of Dreadnoughts and an element that changes the list the most from the Codex list is the loss of the ability to mount Terminators in a Thunderhawk. Instead the larger more powerful Bike formations will need to pull their weight. These formations do fit inside a single Thunderhawk though so you can double dip on mobility while also having the ability to retreat formations off the table to safety. 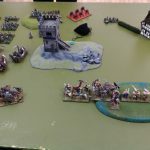 Another point to note is that the 8 strong bikers (they also gain the Walker rule to deal with rough terrain well) with ‘And They Shall Know No Fear’ are extremely tough to completely remove from the table and can form a real battle line. The supporting elements are still small and vulnerable to casualties though so playing intelligently is key. Rushing headlong forwards might at first glance appear a good idea but the Khan would shake his head in shame to see it. use your speed to get your marines where they need to be in support of one another. Make sure every fight is in your favour and crush your opponent piecemeal while your mobile support assets hinder their ability to counterattack. Retaining the flexibility and mobility options of the Codex marines but gaining access to some (expensive) fearless CC focused units in the Death Company and Dreads as well as larger assault formations (6 stands rather than 4) your focus should be on getting your excellent fighters right into the enemy as rapidly as possible – whilst still paying attention to getting supporting fire elements in place first! The aerial, orbital and ground based transport options available to the Marines should make delivering your powerful fighters fairly reliable too. The main risk here is that you are forced to take the expensive death company and without some supporting elements (transports for example) they can be difficult to get into a position to do anything meaningful making them a larger points sink. Furthermore many of your unique units are CC focused which means enemy skimmers can render them notably weaker and their CC ability only really comes into play on the offensive as the enemy can engage you and remain outside of your CC range and force firefights (bear in mind the attacker will only ever go for CC if they stand to gain from doing so while the defender can be stuck in firefight unable to use their fantastic CC ability). The Baal Predator however is fantastic and use of Landing Craft to deliver right into the thick of the enemy is recommended. Wether Baals make up for the loss of Devastators is debatable as is the inefficiency of transporting Assault Marines in Thunderhawks (because they are 6-strong you can only fit one formation in a Thunderhawk while you can fit 2 of the 4-strong ones inside meaning you can deliver 8 in one go rather than only 6). Assault Marines with added Vindicators can be a good option, bringing meaningful firepower alongside potent CC troops. Also very thematic to have the bunker busters breach a hole that the assault marines then pile into and pry open! Overall I’d consider the Blood Angels to be a very potent list, it loses some Codex options in return for a few other unique options of its own. Arguably stronger than the Codex list but with enough stuff lost to make it a conscious choice to play this way. Black Templars are a tweaked form of the Codex Marines list that can be played in the same way as them, if so desired. They are intended to be a space ship and orbital drop oriented faction being required to take at least a Strike Cruiser (which many lists would want to take anyway) and gaining access to more ways of transporting tanks to the board and access to larger tactical formations. In return they lose a bit of flexibility and lose Scout formations (instead gaining the neophyte option to bulk up Tactical Formations). 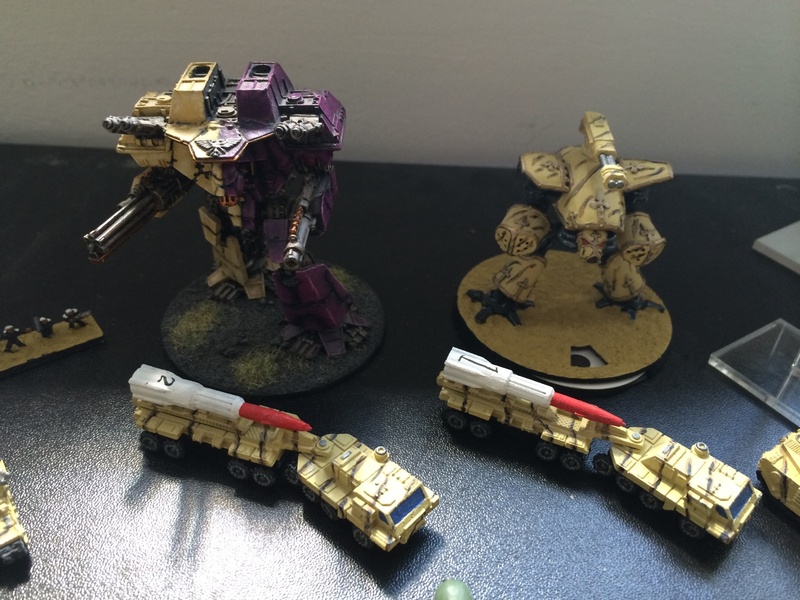 Their unique strengths are in the ability to bring on and deploy more assets by either air or planetfall and retaining mobility while doing so through use of Thunderhawk Transporters. A Tactical Company with Neophytes and Rhinos can planetfall out of a spaceship mounted inside a pair of Thunderhawk Transporters and retain their tactical flexibility and mobility through bringing their transports with them. They’d also gain the ablative toughness of the Transporters for their initial landing. This option is not cheap however, costing 275pts for the Transports on top of the marines themselves. Overall I’d consider this list slightly inferior to the Codex or Dark Angels list in overall competitive power but adding in more options to make orbital drops effective. If you want to run an Orbital Drop focused list however this is probably better than what you could build from the Codex list. A fairly major divergence from the Codex here. Almost every formation is different, either larger, lacking certain options, gaining others and so on. 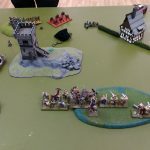 While the army as a whole remains focused on engagements and mobility to get your fighters where they need to be for support it’s less likely to be hitting and leaving the table again, instead relying on their greater numbers in their formations to power through and keep their assault going. Be careful with the upgrades, taking too many will reduce your overall activation counts but taking a few in the right places can make for some decidedly tough formations. The Grey Hunters with additional Grey Hunters in Rhinos can rush forward early and take up a major position and hold it against most enemy threats or be used as part of a broader assault to provide a huge amount of quality supporting fire. try to engineer scenarios where you have your Grey Hunters within 15cm of two different enemy formations and then have two separate smaller formations engage those enemy one by one. The 10 additional 4+ firefight shots from the Grey Hunters is extremely effective especially if you can use it multiple times in a single turn. Due to the way army construction works for Space Wolves you will almost certainly be taking 2 Grey Hunter companies so learning how to effectively bring their numbers to bear is valuable as they will need to be proactive to get into firefight support range or CC engagement ranges as the loss of their missile launchers means they don’t have quite the ability to drive up to a position and reach out to threaten in the same way a tactical company can. If you can’t get a handle on getting into that 15cm support range bubble you may struggle with having a sizeable portion of your army unable to attack efficiently. 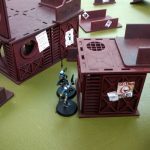 What you lose however is missile launchers on your grey Hunters so you need to find other ways of placing your blast markers to set up your engagements. Luckily you retain access to Land Speeders who are fantastic at doing exactly that. Overall the Wolves of Russ play differently to the rest of the marine armies, able to bring greater numbers to bear and being generally more resilient due to formation size they can be more forgiving and playing to their particular strengths can mean skipping out on some of the more common Codex elements due to costs. 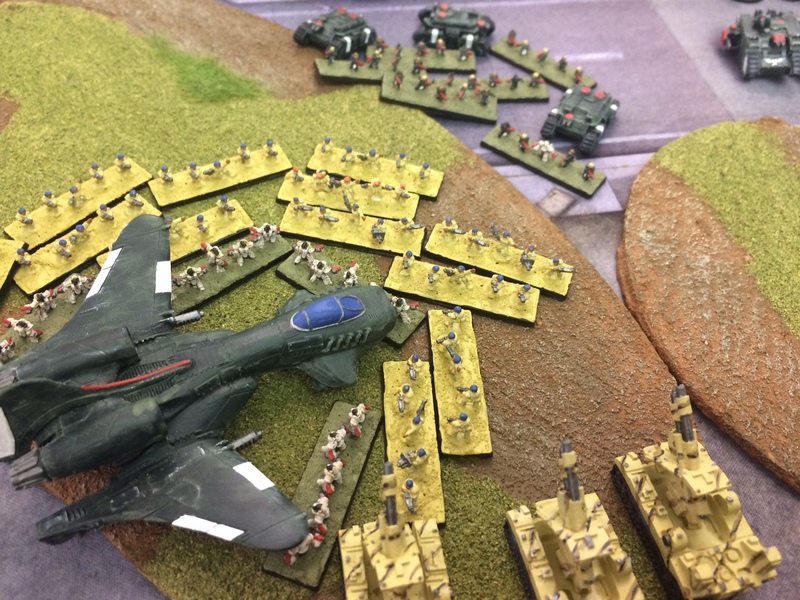 They do however retain the ability to play like a Codex list and air dropping a pair of Grey Hunter companies can be a fearsome sight and challenge for your opponent to deal with! Required reading for all Citizens of Guilders-Ford! 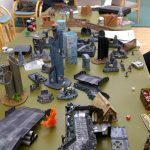 6 players practicing for Shadow War campaign. 3 player game of Kings of War. 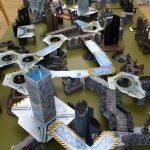 Huge 6 player Necromunda game against a horde of zombies. 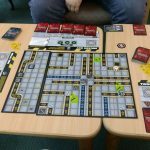 3 playing Roborally and World of Tanks card game. 2 playing the intro games to Walking Dead from Mantic Games. 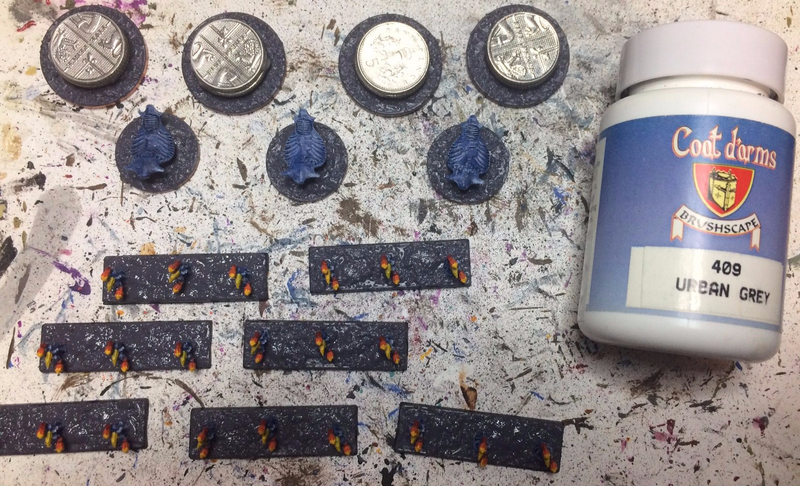 Hi again, in my last article I mentioned giving a guide to painting models at 6mm scale so it would be remiss of me to not at least give it a go. A common refrain I hear from people when they are faced with the prospect of 6mm is that they could never paint something that small or their eyesight would never handle it or there’s just so many models they’d never want to attempt a project that large. 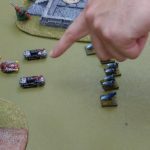 What I’d like to do with this article is try to dispel some of that and maybe get you to give it a go, I think you’ll find that a few simpler techniques can turn up a nice looking force you can be proud to put on the table – even if it wont be winning any painting competitions! First though setting some expectations. I am not a particularly noteworthy painter, I’m more interested in getting some paint on my models and getting them on the table. I do, however, take a bit of pride in having something I’ve worked on at least look the part. I did some hunting on eBay and raided the remnants of a few friends bits drawers to get together enough for 10 stands of demons and 4 silver towers. Ebay is not the only place to go to get things like these incidentally, there are some good proxies here. At this first stage we want to clean up any plastic spurs or metal flash etc. and then spend a little while looking at the models and their features and deciding what we want to paint and how we will pick which parts to paint what colours. And it’s here that I’ll mention the first key take away point. At 6mm (and other small scales) gentle colour gradients and variants tend not to come out. You have a small amount of space to make the model have some visual interest so strong contrasts help achieve this. The second point is with colour monotony. That is, having large blocks of the same (or very similar) colours. At 6mm this can make the entire model appear to just be one colour and thus not visually interesting. What is worth looking for on your models is small bits or details that you can pick out in a different colour, a little bit of variation to break that monotony. 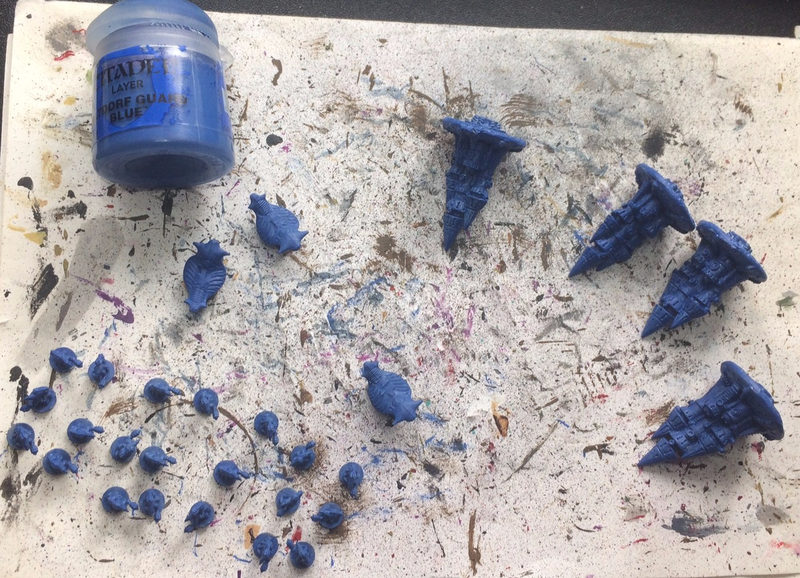 For the Silver Tower the colour palette is going to be yellow, blue and gold as those are the colours of the Thousand Sons, luckily these are strongly contrasting, thanks GW! 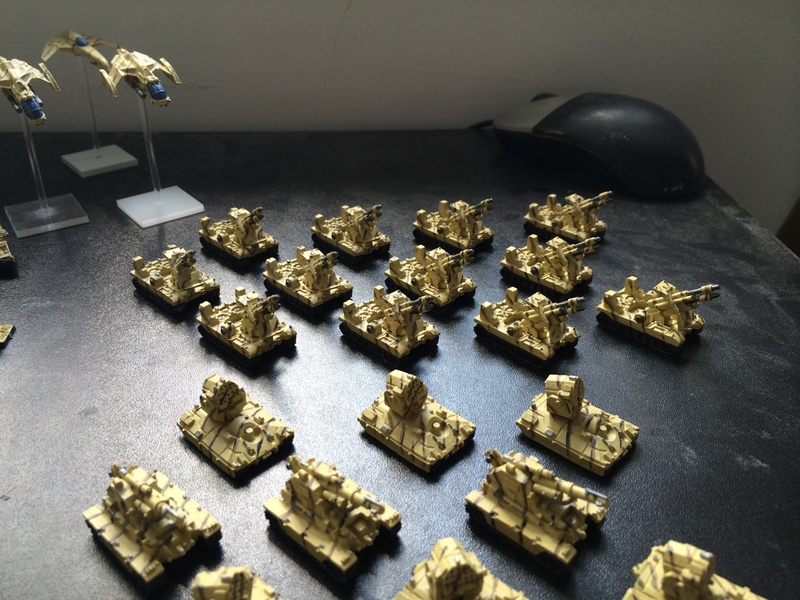 I know that the main body is going to be blue so that’s simple…but it runs right into the colour monotony problem but looking over the model all those small gun turrets and little tubing/piping things give me places to sensibly place the gold (or other colours) to break up that monotony. Finally the roof tops of the towers can be in yellow…but again that’s quite a lot block colour yellow and not really much in the way of detail bits to pick out. 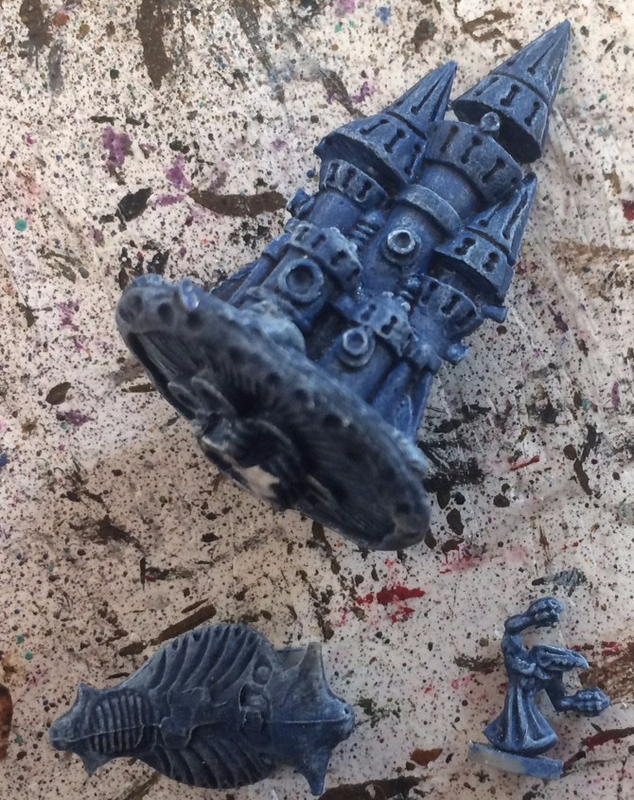 So I will go back to the well of ideas on how to resolve that and Tzeentch comes to the rescue again. Flames. Instead of painting the roof tops in block yellow instead paint them red/orange/yellow in bands to represent some flame which should make them a touch more interesting. What I’d recommend to anyone out there starting to paint (especially at 6mm but other scales too) is to spend maybe a little bit just looking over your models and working out what bits should be what colours and how you’ll keep it looking visually interesting. Google other people’s painting, steal ideas liberally. If you really want to go in-depth you can use this moment to plot out the order in which you’ll paint the colours on. As a hint for doing that remember that drybrushing tends to be a messy process so generally you’ll want to do it before doing your detail work. Because a 6mm model is so much smaller the likelihood of seeing the detail is reduced, especially for parts of the model that share the same colour. This means that darker colours especially blend the details away into nothing as the natural shadows that might highlight the detail are not readily visible against the dark paint. What can end up happening is a model looks like it’s just one colour slapped on (and…I mean…we’re being lazy painters here so slapping on a few colours and calling it a day is what we want but we don’t want it to look like we’ve done that!). Now we roll on to the next stages that will serve to highlight the detail and differentiate parts of the model. These stages are dead quick and real easy and they even serve to conceal the finish of that single coat of prior paint. At 6mm these are an extremely useful tool, even more so than at bigger scales. Because we chose a mid tone blue for the prior step we can really easily just use a dark shade wash. So grab your wash, grab your brush and apply it all over. Quick and easy. Then let it dry (takes a bit longer than a normal paint and then wait even longer because the step after is a drybrush so we don’t want any remaining wetness from this step affecting the drybrush). get a little bit of the paint on the brush and then wipe most of the paint away on a tissue/etc. I chose white as the drybrush colour for the heavy contrast, but reusing the same mid shade blue or a paler blue would also work just fine too. At 6mm drybrushing is fantastic because the models do actually have meaningful detail, it’s just difficult to pick all of it out with painted highlights using a brush normally and when you need to paint 30+ individual guys to make a single playable formation it can get real tedious real fast. Drybrushing is both quick and gets those details. It also helps to break colour monotony from point 1 by putting another differing colour onto the samey colour blocks. Next comes the details, where we pick out the pieces we want in our different colours. For me this is gold and yellow (with some red and orange for the flames). For these colours (especially the yellow) you might need multiple coats to get the finish you want, don’t skip out here like we did for the earlier blue layer though. The flames are achieved by painting red all over the section I want in colour (red 100%), then painting back over part of the bits in red with orange (orange 75%) then again with yellow over some of the orange section (yellow 66%) which leaves three distinct bands of colour. When painting I made of my brush strokes vertical, brushed towards the tip of the towers and I didn’t care too much about the places where the colours cross over being too neat. The last thing to do was to wash all over the ‘flames’ with a yellow wash (casandora yellow) as this blends the three colours together a bit and stops them having such harsh crossover points. 4. You’re going to be 20+ inches away most of the time, worry about how it looks at that range! That’s mostly a point to help give some confidence and encourage you to go out and give it a go. I’ll leave the advice and guides on how to get fantastic close-ups at this scale to painters more accomplished than I. At 6mm basing is very important. It doesn’t need to be some mini diorama all its own, but it should always be done. A middling quality basing job can make a load of middling quality models look great on the table. How about we cheat to get there? 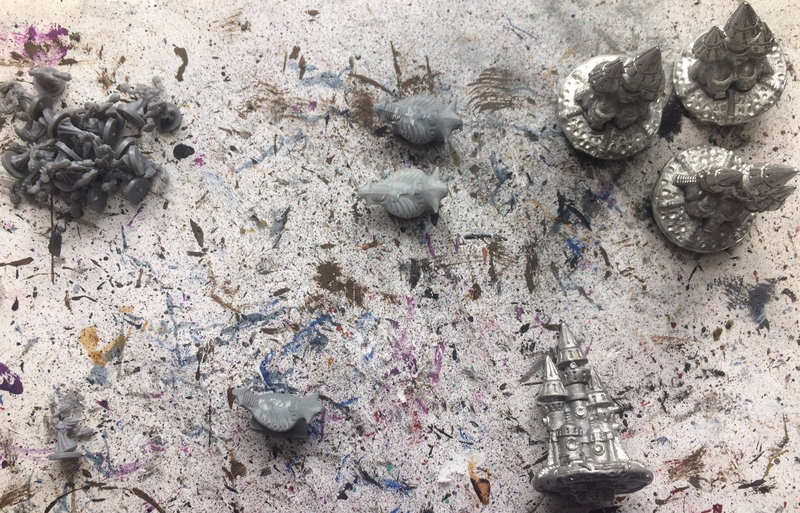 I use textured paint (from coat d’arms specifically) as it’s basically paint+sand and is fine enough that the grains don’t look weird next to a 6mm figure. 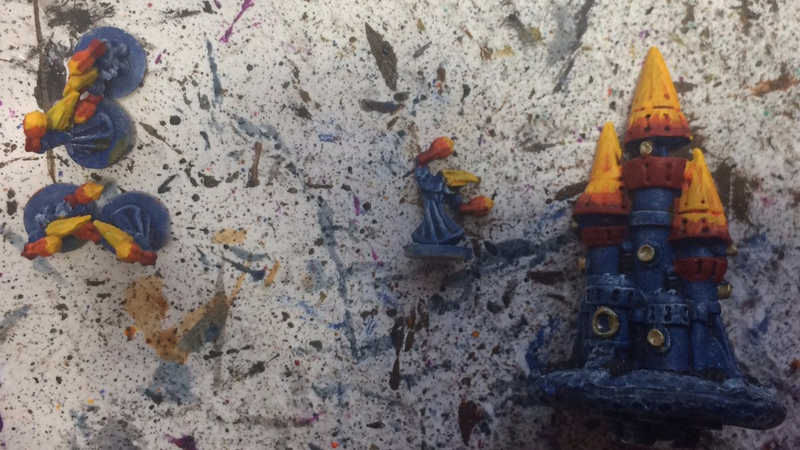 Slap it down on the bases all over, just avoid getting (too much…) on your models. You might notice the 5p pieces piled on top of one another. I use these to add some height to skimmers that feels much sturdier than the thin flight stems models sometimes come with. Now finally the finished pieces. Notice how the camera is a little bit further away? That’s how you’re going to be seeing them on the table most of the time! Focus on how they look at this kind of range, not when zooming in. Now, you may disagree that they look good or that you’d be happy to field them looking like that and that is, of course, perfectly fine. Paint to the standard that you’re comfortable with or proud of. For me though this is a quick, simple way that doesn’t really need much fine brush control and doesn’t need spending ages highlighting details. Hopefully you’ll be able to take a tip or two from this, hopefully you’ll find maybe a bit of confidence to give painting at this scale a go. Maybe even it will help dispel some of those ‘I can’t paint something that small!’ comments.